Travel to and within the U.S. grew 1.6 per cent year-over-year in September, according to the U.S. Travel Association’s latest Travel Trends Index (TTI)- marking the industry’s 105th straight month of overall expansion. But U.S. travel economists add several strong caveats to the overall positive trend. Growth in domestic travel is levelling off, for example. 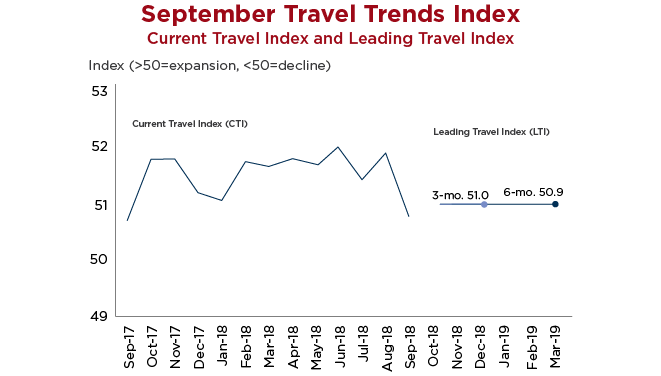 That segment had been strong in recent months, buoyed by robust consumer spending and consumer confidence reaching heights last seen in 2000. Business travel, which registered a faster rate of growth than leisure travel in August, appears to have plateaued; domestic travel in September was almost entirely supported by leisure travel, which grew at a decelerated rate of 1.8 per cent. It would also be easy to misconstrue the international component of the latest TTI, which showed 4.4 per cent year-over-year growth. But with inbound having posted a sharp 2.2 per cent drop in September of 2017, any year-over-year improvement at all is liable to appear over-inflated. Furthermore, the international Leading Travel Index (LTI) predicts that the market will not expand any further at all in the next six months.